BURGUNDY. Next in line of colorful denim are these deep Burgundy ones I found at Topshop. The color is even more stunning in person and I love the dramatic effect they provide when paired with black & gold! The Pierre Cardin knit I’m wearing is probably one of my most treasured vintage finds of all times. I remember screaming with joy when I found it at the bottom of a gigantic pile of random raindeer sweaters (even more so when I saw the price tag, pretty much got it for free). It’ s one of those lifesaver pieces that I whip out whenever an outfit is in need of that extra oomph, and it never fails! MANGO coat. PIERRE CARDIN gold sweater (vintage). ZARA scarf. TOPSHOP jeans. DIN SKO shoes. FENDI bag. ZARA gloves. MICHAEL KORS watch. This entry was posted in Outfit and tagged Burgundy, Gold, Pierre Cardin, Zara by Carolina Engman. Bookmark the permalink. amazing outfit dear! those gloves are gorgeous! love the scarf,it adds a special touch. woo this look is amazing. and your gloves are such an eyecatcher! I absolutely love your lipstick…could you please tell me what is the brand and colour? I really adore this look! gorgeous! I’m currently obsessing over deep colors too specifically burgundy, purple and military green which I just found out that you three, Andy + Chiara, are wearing! I guess great minds really do think alike! ;) I also love your oxblood red pants! Wish I have all the money in the world!!!!!!! Nice outfit! I especially love the gloves. Those gloves are suuuper pretty! i am loving the fend bag! so chic. Love the sweater and the cheetah print scarf!! Love every piece of your outfit!Very stylish!! I love your animal print pashmina! amazing outfit. those gloves and that jumper are amazing!!! Beautiful and very stylish! Love your gloves and scarf! chic mix of animal prints! I need that scarf! Beautiful. The sweater is really nice – such a good find! Love the mixtures- very rockin roll. Such a beautiful outfit!! Love it! You look absolutely gorgeous and I’m in love with your gloves, so stunning ! Gotta find a pair like those ’cause it’s so cold outside. WOW, I love that sweater and and with the touches of gold with those burgundy pants makes it even better. I would love it if you checked out my blog, I have interesting fashion posts you might love to read. I love this outfit that cheetah print is amazing — especially with the metallic sweater. 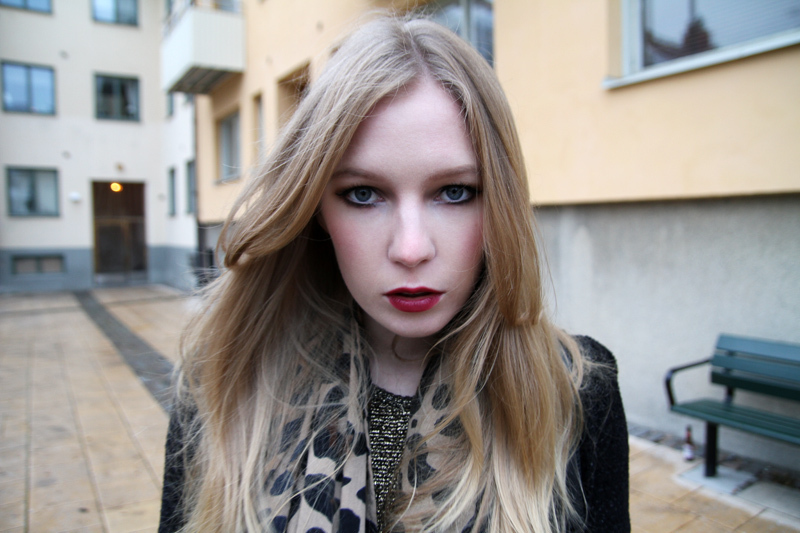 I love the leopard scarf and your make-up is amazing! Great outfit! So that outfit is amazing. Those pants look like the perfect color. I love the shoes. And as someone who just through a fit on their hair that is now tiny, I’m super jealous of your hair. Love burgundy and animal prints together. Not my cup of tea,I don’t think gold and burgundy really match. you look wonderful and we so much love your leopard scarf! Carolina, these beautiful even with Zara clothing. You have an incredible image, conveys the same feelings as the sphinxes in the form of ancient Egyptian cat … you are incredibly adorable but feared, I imagine that in reality are normal and all. You like Barcelona? already know her? I now live in Munich and I like more, perhaps by people, goes cool. I am obsessed with those gloves! Burgundy is super chic on blondes!! Love it! I love that metallic sweater!!!! Great look, and amazing gloves!! Looking at the photos , first thing that crosses my mind is : how interesting and inspiring face . You have the luck to be able to wear anything , cause things look different when you wear them , no mater the style , or the color . I follow your blog only few days , but that’s the first thing I’ve noticed . I’d definitely turn my head around to take a second look! Cute outfit! Love your gloves! The studded detail on the gloves is GORGEOUS! ~great ensemble and you are right, it’s hard to appreciate the color of the pants in the pics, but I know the exact pair you are wearing and they are fantastic! I’ve been wanting some burgundy or cranberry colored jeans- these are awesome! Like your style! Really Nice. Your gloves are so chic! Absolutely wonderful! Amazing! I like the outfit!! Beautiful outfit – love it! Oh my god. I LOVE this outfit! I think this is one of the best ones I’ve seen all month! Not only am I obsessed with the colour palette, I also just love the simple statement it makes! Beautiful! J’adore!!!!! Carolina you are stunning! Tout est la ou il faut! And I love those gloves! love the gloves and the bag! Super niceeeeee outfit!!!! i love your blog!!! if you like fashion you should chck my blogÂª!! maybe you would like it! I have a new post about my day yesterday at a photoshoot!! kiisses!! My god I just love everything about this outfit. Every detail just flows together so effortlessly. i love your style,amazing outfit! i love those long leopard scarf combined with fendi bag. Perfect! I love burgundy and leopard print together so much! Your lip color is way intense. I love it. That cardin’s sweater is amazing. No soy de Burdeos pero tu estas guapÃ­sima . that outfit looks great on you, love it! I really love the whole outfit !! that sweater is real cute ! wonderful that you got it for almost free ! Burgundy and Gold are my favorite colors together!!! This top reminds me of a Sugar Lips top that has hints of gold in it. I love this look.. Especially the scarf and sweater!! There is not a thing is this outfit I am not DYING to own, this looks spectacular together. I have been searching for the perfect burgundy or wine color jeans and you may have found them. This is beyond perfect!